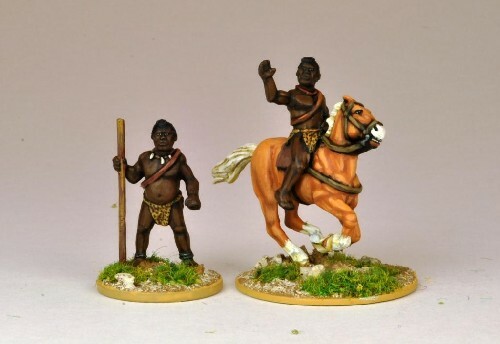 This pack gives you two models of King Lubengula, ruler of Matabeleland during the Matabele War of 1893. The first model is a horse mounted figure of him in his younger days when he was a noted horseman. The second figure is based on a famous contempory drawing of him at the height of his powers, standing with a staff. Contains one rider, one horse and one standing figure. Glue is required to make this model. The model is 28mm sized, supplied unpainted and made of metal.